Abstract | Although commercial herbicide are very effective in controlling weeds but their continuous use causes toxicity and develop resistance in weeds and pollute underground drinking water. Alternative environmental friendly methods are needed to explore possibility of weed control and enhance crop yield. Sorghum extract and their application times on weed dynamics, phenology and leaf tracts of variety Atta Habib was sown at the Research Farm of Agronomy, The University of Agriculture Peshawar, Pakistan throughout 2015-16. Used of sorghum extract with three concentrations (1:3, 1:4, 1:5), weedicide (affinity) with three different levels (1/3, 1/ 2, 2/3 of the recommended dose) and 3 times of application (emergence,tillering,50% at emergence + fifty percent at tillering). Herbicide sole, weeded by hand and un weeded plots used for comparison. Results showing that concentration of sorghum and appliance point considerably increased days to heading, anthesis, physiological maturity, area of flag leaf, tillers number m-2 and spikelets per spike and decreased weed density in wheat. Sorghum extract sprayed at 1:3 gave more days to anthesis (123.4), days to physiological maturity (155.0) and sorghum concentration applied at 1:4 gave significantly more tillers m-2 (194.5) and more spikelets spike-1 (21.0). Sorghum extract concentration with combination of weedicide sprayed at tillering stage gave less number of weeds (76), minimum weed fresh weight (170) and dry weight (132), increased days to heading (116.5), increased days to anthesis (123.0), increased days to physiological maturity (154.4), maximum number of tillers m-2(192.6) and more number of of spikelets spike-1 were found when treatments applied 50% at emergence + 50% at tillering or tillering stage. Days to heading were found non-significant. It is concluded that sorghum extract concentration 1:4 with 988g ha-1 of weedicide affinity applied at tillering stage is recommended for high days to heading, anthesis, physiological maturity, amount of tillers-2, area of flag leaf and more spikelet’s spike-1 of wheat crop. Citation | Misbahullah, S.K. Khalil, A. Muhammad, A. Tabassum and S. Fahad. 2019. Weed density, phenology, tillers and flag leaf area of wheat affected by sorghum extract concentration in combination with herbicides and application time. 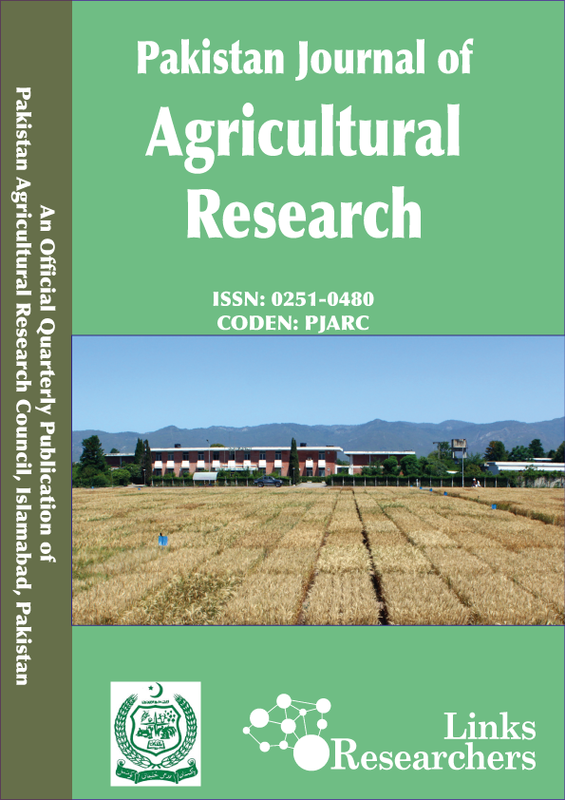 Pakistan Journal of Agricultural Research, 32(1): 124-133. Wheat is an important food for most of the human and livestock in this world (Khan et al., 2009). 9.170 mh of area was cultivated under wheat with production of 26.346 m tones with mean yield of 2873 kg ha-1. While in Province of KP, wheat was sown on an area of 0.746 mh with production of 1.760 m tones. The average of wheat yield in Khyber Pakhtunkhwa was 2359 kg ha-1 (MNFS and R, 2014). In Pakistan, due to weeds create serious issues for production of crops, management of weed is ignored because of less knowledge and weak financial status. For better production of crop, poor farmers cannot have enough money for the cost of weed management practices. In the result weeds adversely affect the quality and production of seeds and maximize costs for production, due to which high economic losses. Some of the noxious species of weeds might be a potential threat to crops, distribution of moisture, space, sunlight and nutrients (Elahi et al., 2011). Weeds have the potential to compete with crops for water, nutrients, carbon dioxide, solar radiation, and space. Grain yield losses in wheat by weeds are accountable for 30% in Pakistan which annually amount of Rs. 1150 million (Ahmad et al., 1991). Quality and yield of crops are affected by weeds and need extremely cost in the production of food (Blair et al., 1992). Consequently, weeds control is essential and important for higher production of crops. Allelopathy is an environmental friendly, natural, low-priced to manage density of weeds and enhance production of crop. Ahmad et al. (1991) concluded that sorghum crop is highly allelopathic in nature and successfully used to handle weeds in irrigated wheat without adversely affect of crop. Mature sorghum plants contains 9 chemicals which are soluble in water (Cheema, 1988). Cheema and Khaliq (2000) used water extract of mature sorghum plants and resulted that 35-40% weeds are reduced due to water solution spray and increased wheat production to 35-40%. At very low concentration of sorghum roots, the growth of various weed species are reduced (Roth et al., 2000). Strong potential offered by allelopathic crops for cultivars expansion and suppressed weeds (Weston and Duke, 2003). Losses of yield of wheat due to weeds and the importance of allelochemicals in management of weeds, field experiment was conducted in climatic condition of Peshawar region. A field trial was carried out at Agronomy Research Farm, The University of Agriculture Peshawar, Pakistan in cool season 2015-16. An experiment was carried out in RCBD (randomized complete block design) with 3 replications. Size of the plot was 3 m x 1.8 m. Every plot were consist of 6 rows with row to row distance of 30. 120 kg ha-1 was the rate of the seed. N and P fertilizers was applied @ 100 and 90 kg ha-1. Phosphorus was applied as basal dose while nitrogen was applied in split application of 2. Dissimilar application of sorghum herbage were applied i.e C1: 1:3 (1 kg sorghum plant herbage+3 liters of water), C2: 1:4	(1kg sorghum plant herbage+4 liters of water), C3: 1:5 (1kg sorghum plant herbage+5 liters water) with herbicide ratios i.e HB1 (1/3 of the recommended rate), HB2 (1/2 of the recommended rate) and HB3 (2/3 of the recommended rate). Different sorghum herbage and herbicides concentrations were applied at emergence, tillering begins and Half at emergence + half at tillering begins stages of wheat crop. Days to heading and anthesis data were calculated by counting the days from sowing to the date when 80% plants complete heading and anthesis stages, respectively in every subplot. Days to physiological maturity data were observed by counting the days from sowing to physiological maturity. Number of tillers were recorded by counting the numbers of tillers in central three rows of each sub plot, and was converted into numbers of tiller m-2 using the formula. Flag leaf was measured lengthwise and widthwise at the broadest point. Flag leaf area was measured as the product of length and width then multiplied by 0.75 (Francis et al., 1969). Five spikes were selected randomly in each plot and then spikelets were separated and counted. The mean value worked out and record as number of spikelets per spike. Days to heading was significantly influenced by C × R interaction, control vs rest, hand weeding (HW) vs weedicide (WS) and herbicide sole while, sorghum concentration (SC), affinity ratio (AR), application times (AT), C × T, C × R × T interactions and weedicide sole vs ratio were found non significant (Table 1). C × R interaction indicated that days to heading increased with increase in weedicide affinity from 1/3 (670) to 988g at sorghum concentration of 1:3 and 1:4. Thereafter days to heading decreased with further increase of affinity to 1317g (Figure 1). Table 1: Days to heading of wheat as affected by sorghum water extract in combination with herbicide application time. *Affinity recommended dose= 1.976 Kg ha-1; LSD0.05 for concentration= 0.80; LSD0.05 for application time= 0.80, LSD0.05 for ratio= 0.80. Similar increase in days to heading was noted at 1:5 sorghum concentration. Control vs rest gap showed that less days to heading (116.05) were recorded from rest while control plot took more days (120). Hand weeded plots took less days (113.3) compared with Weedicide treated plots (116.1). In weedicide vs ratio contrast the manimum days to heading was obtained from ratios (116.05) while weedicide treated plots took highest days to heading (117). Days to heading was significantly influenced by control vs. rest, hand weeding vs. weedicide, herbicide sole, herbicide sole vs ratio, C × R interaction, whereas sorghum concentration, affinity ratios, application timing, C × T, R × T, C × R × T interaction were found non-significant. The control vs rest contrast indicated that less days to heading were required from rest (treated plot), while control plot (no treatment) required more days. Hand weeded plots required less days compared with weedicide treated plots. In weedicide vs ratio contrast, minimum days to heading were required for ratios, while weedicide treated plots took maximum days to heading. This might be due to successful weed control in treated plots and hand weeding plots because weed compete with crops for resources like sunlight and nutrients. These outcome are related with (Jabeen et al., 2011) who reported early days to heading, followed by hand weeding . It was concluded that plant height, spike length, biological yield etc was increased due to application of foliar sorghum extract (@ ratio of 1:5) in wheat field, while weed density and weed dry weight were decreased (Tabassum et al., 2018). Table 2: Days to anthesis of wheat as affected by sorghum water extract in combination with herbicide application time. *Affinity recommended dose= 1.976 Kg ha-1; LSD0.05 for concentration= 0.56; LSD0.05 for application time= 0.56, LSD0.05 for ratio= 0.56; **Means within the same category followed by different letters are significantly different at P ≤ 0.05 using LSD test. (SC), affinity ratio (AR), control vs rest, hand weeding vs herbicides, while application timing (AT), herbicide sole vs ratio, C × R, C × T, R × T, C × R × T, interaction were found non-significant. More days to antheis were required by sorghum concentration (1:3) while other concentrations (1:4, 1:5) required fewer days to heading. Affinity applied at (988g) required more days to anthesis compared with lower or higher dose. The control vs rest contrast indicated that more days to anthesis were obtained from rest, while control plot resulted in fewer days. Hand weeded plots required less days compared with weedicide treated plots. This might be due to successful weed control in treated plots and hand weeding plots because weed compete with crops for resources like sunlight and nutrients. Results are in line with (Nikneshan et al., 2011) who suggested maximum days to anthesis with herbicides application followed, by hand weeding . Same results were were reported by Suthep et al. (2001). Days to physiological maturity were appreciably inclined by sorghum concentration (SC), affinity ratio (AR), rest vs control, HV vs weedicide (WS) and weedicide sole vs ratio, while application time (AT) and all interactions were found non significant (Table 3). Higher sorghum concentration (1:3) required more days to maturity (155.0) compared with other concentrations of 1:4 or 1:5. Low affinity dose (0.670 Kg ha-1) required more days to maturity compared with higher dose (0.988 Kg ha-1) The control vs rest line indicated that less days to physiological maturity (154.24) were required from rest, while control plot required more days to maturity (156.33). Hand weeded plots took less days (151.7) compared with weedicide treated plots (154.3). In weedicide vs ratio contrast the maximum days were required by ratios (154.47) while weedicide treated plots took fewer days (153). Significant variation in days to physiological maturity was noted in response to sorghum concentration, affinity ratio, control vs rest, hand weeding vs. weedicide, herbicide sole vs ratio and herbicide, whereas application timing (AT), C × R, C ×T, R × T, C × R × T interaction were found non significant. Higher sorghum concentration (1:3) required more days to maturity compared with other concentrations of 1:4 or 1:5. Low affinity dose required more days to maturity compared with higher dose. The control vs Rest contrast indicated that less days to physiological maturity were required from rest (treated-plot), while control plot (no treatment) required more days to maturity. Hand weeded plots took less days compared with weedicide treated plots. In weedicide vs ratio contrast the maximum days were required by ratios while weedicide treated plots took fewer days. This might be due to successful weed control in treated plots and hand weeding plots because weed compete with crops for resources like sunlight and nutrients. Quicker maturity was gained by treated and hand weeding plots. Arif et al. 2015 also reported quicker days to maturity with herbicide sole by hand weeding. Similar results were reported by Khan et al. (2009). Table 3: Days to physiological maturity of wheat as affected by sorghum water extract in combination with herbicide application time. *Affinity recommended dose= 1.976 Kg ha-1; LSD0.05 for concentration= 0.65, LSD0.05 for application time= 0.65, LSD0.05 for ratio= 0.65; **Means within the same category followed by different letters are significantly different at P ≤ 0.05 using LSD test. Table 4: Number of tiller m-2 of wheat as affected by sorghum water extract in combination with herbicide application time. *Affinity recommended dose= 1.976 Kg ha-1; LSD0.05 for concentration= 6.53, LSD0.05 for application time= 6.53, LSD0.05 for ratio= 6.53; **Means within the same category followed by different letters are significantly different at P ≤ 0.05 using LSD test. more tillers compared with weedicide treated plots. In weedicide vs ratio contrast the maximum tillers was obtained from weedicide treated plots while ratios treated plots gives less number of tillers. This might be due to reduce in weed density, that results in minimum competition in wheat plant with weeds and more availability of space, nutrients, light and water etc. The reduction in weed density boosted number of wheat plants m-2. This result is in relation with Anwar (2002) who reported highest number of tillers with herbicide application. These results were also reported by Jabeen et al. (2011) who observed notable increased in number of tillers with allelopathic leaf water extract of different plants. Table 5: Flag leaf area (cm2) of wheat as affected by sorghum water extract in combination with herbicide application time. *Affinity recommended dose= 1.976 Kg ha-1; LSD0.05 for concentration= 3.05, LSD0.05 for application time= 3.05, LSD0.05 for ratio= 3.05; *Means within the same category followed by different letters are different at P ≤ 0.05 using LSD test. Table 6: Spikelets spike-1 of wheat as affected by sorghum water extract in combination with herbicide application time. *Affinity recommended dose= 1.976 Kg ha-1; LSD0.05 for concentration= 0.98, LSD0.05 for application time= 0.98, LSD0.05 for ratio= 0.98; **Means within the same category followed by different letters are different at P ≤ 0.05 using LSD test. weeded plots produced maximum flag leaf area in contrast with other treatments, while lower leaf area were noted in control plots. The predictable reasons for increasing leaf area is might be due to the weeds diminution in treated plots, which results in less competition with wheat crop for nutrients, moisture and light. This reduction in weed density might boosted wheat plant growth and development and generate taller plants with vigorous leaves. Anwar et al. (2002) reported more leaf area with herbicides application, followed by hand weeding. Combination of grassy and broad leaf herbicides was superior to their separate application for weed control in wheat as reported by Cheema (2012). Same results were reported by Ashraf et al. (2007) who observed that sorghum water extract applied at different timing notably increased leaf area (9.62 cm2) was recorded from ratios treated plots. Spikelets spike-1 was significantly influenced by sorghum concentration (SC), affinity ratio (AR), application times (AT), control vs. rest, weedicide sole vs Ratio and C × R × T interactions, however hand weeding (HW) vs weedicide (WS), C × R, C × T, R × T interactions were found non significant (Table 6). Lower sorghum concentration (1:5) resulted in less spikelets spike-1 (19.6), while maximum number of spikelets (20.4) were obtained from 1:4 (1kg sorghum and 4 liter water) sorghum concentration. Lower dose of affinity (670g) produced less spikelets (18.5). Spikelets increased with each increment of affinity and more spikelets (21) were recorded from affinity applied at (988g). Thereafter spikelets spike-1 decreased. Sorghum herbage applied at tillering stage produced more number of spikelets (20.6) than sorghum applied at emergence stage. C × R × T interaction showed that maximum spikelets spike-1 were noted for sorghum concentration (1:4) applied at tillering stage at the recommended dose of affinity 988g (Figure 6). Thereafter number of spikelets spike-1 decreased with further increase in sorghum concentration and affinity ratio. The control vs rest contrast indicated that more number of spikelets spike-1 (19.67) were noted from rest, while control plot resulted in less spikelets (16.67). Hand weeded plots produced more spikelets (20.7) compared with weedicide treated plots (19.6). As hand weeding efficiency were increased after 45 days of sowing wheat for getting maximm spike m-2, grain spike-1 and grain yield (Naseer-ud-Din et al., 2011). In weedicide vs ratio contrast, the minimum spikelets spike-1 were obtained from ratios (19.36), while weedicide treated plots gave maximum spikelets spike-1(22.11). Spikelets spike-1 were significantly influenced by sorghum concentration, affinity ratio, application times, control vs. rest and C × R × T interaction, while handing weeding vs. weedicide and weedicide sole vs ratio, C × R, C × T and R × T interactions were found non-significant. Spikelets spike-2 increased with increase in sorghum concentration and maximum spikelets spike-2 was obtained from 1:4 sorghum concentration. Number of spikelets spike-2 increased with each increments of weedicide and more spikelets spike-2 were recorded from affinity applied at (988g). Thereafter, spikelets spike-1 decreased. Sorghum herbage applied at tillering stage produced more spikelets spike-1 than sorghum applied at emergence or 50 at emergence + 50 at tillering stage. The maximum spikelets spike-1 in control and treated plots might be due to the best weed control or might be due to the positive effect of combination of allelochemicals or due to its best effect on weed, while the lowest number of spikelets spike-1 obtained from weedy check plots were probably due to the weed competition against the wheat crop which might have highly reduced the flow of nutrients towards the spikelets spike-1. These results are line with Cheema et al. (2003) who noted that herbicide treatments significantly increase number of spikelets spike-1. The authors acknowledges the support of research field staff during preparation of sorghum concentration and application. Sorghum water extracts at 1:4 ratio with 1/2 (0.988g ha-1) of the recommended herbicide dose applied at tillering stage is recommended for obtaining higher flag leaf area, maximum number of tillers m-2 and more number of spikelets spike-1 in wheat crop. Misbahullah managed all experiment. Shad Khan Khalil supervised overall corrections and guidness. Asim Muhammad performed statistical analysis and abstract writing. Afza Tabasum did graphic analysis and Shah Fahad help in collection of data. Afridi, R.A., M.A. Khan, Z. Hussain, S. Saleem, S. Khan, K. Afridi and M. Ali. 2013. Allelopathic effects of rice straw extract on different crops and weeds. J. Agric. Biol. Sci. 8(5): 418-411. Ahmad, A., Z.A. Cheema and R. Ahmad. 1991. Evaluation of sorgaab as natural weed inhibitor in maize. J. Anim. Plant Sci. 10: 141-146. Ahmad, A., Z.A. Cheema and R. Ahmad. 2000. Evaluation of sorgaab as natural weed inhibitor in maize. J. Anim. Plant Sci. 10: 141-146. Anwar, S. 2002. Effect of sorghum extract and other weed control methods on wheat. M.Sc (Hons) thesis, Dep. Agron. Univ. Agric. Peshawar, Pak. Arif, M., Z.A. Cheema, A. Khaliq and A. Hassan. 2015. Organic weed management in wheat through allelopathy. Int. J. Agric. Biol. 17(1): 127-134. Ashraf, M. and M. Akhlaq. 2007. Effects of sorghum leaves, roots and stems water extract, hand weeding and herbicide on weeds suppression and yield of wheat. Sarhad J. Agric. 23: 321-328. Blair, A., S.H. Zahir and N.E. Pearce. 1992. Clues to cancer etiology from studies of farmers. Environ. Health. 18: 205-209. Cheema, Z.A., M. Farooq, A. Khaliq and G. Haider. 2012. Allelopathy for weed management in wheat. Pak. J. Weed Sci. Res. 18: 741-747. Cheema, Z.A., M.N. Mushtaq, M. Farooq, A. Hussain and I.U. Din. 2003. Purple nutsedge management with allelopathic sorghum. Allelopathy J. 23: 305-312. Cheema, Z.A. 1988. Weed control in wheat through sorghum allelochemicals. Ph.D. Thesis, Dep. Agron. Univ. Agric. Faisalabad, Pak. Elahi, M., Z.A. Cheema, S.M.A. Basra and M. Akram. 2011. Use of allelopathic water extract of field crops for weed control in wheat. Int. Res. J. Plant Sci. 2: 262-270. Francis, C.A., J.N. Rutger and A.F.E. Palmer. 1969. A rapid me thod for plant leaf area estimation in maize. Crop Sci. 9 (5): 537-539. Jabeen, K., Z.A. Cheema, M. Farooq and M. Hussain. 2011. Lower doses of pendimethalin mixed with allelopathic crop water extracts for weed management in canola (Brassica napus L.). Int. J. Agric. Biol. 12: 335-340. Jabeen, N., M. Ahmed, S.S. Shaukat and Iram-Us-Slam. 2013. Allelopathic effects of weeds on wheat (Triticumaestivum L.) germination and growth. Pak. J. Bot. 45: 807-811. Khan, I., G. Hassan., M.I. Khan and I.A. Khan. 2009. Efficiency of some new herbicidal molecules on grassy and broadleaf weeds in wheat. Pak. J. Weed Sci. Res. 10(1-2): 33-38. Macias, K., M.B. Khan, M. Hussain and M.A. Gorchani. 2002. Weed management in wheat field (Triticum aestivum) using allelopathic crop water extracts. Int. J. Agric. Biol. 11-6: 751-755. MNFS and R 2014. Agricultural statistics of Pakistan. Govt. of Pakistan. Ministry of National Food Security and Research, division (Economic wing) Islamabad. Naseer-ud-Din, G.M., M.A. Shehzad and J.M. Nasrullah. 2011. Efficacy of various pre and post-emergence herbicides to control weeds in wheat. Pak. J. Agric. Sci. 48(3): 185-190. Nikneshan, P., H. Karimmojeni, M. Moghanibashi and N.A.S. Hosseini. 2011. Allelopathic potential of sunflower on weed management in safflower and wheat. Aust. J. Crop Sci. 5: 1434-1440. Tabassum, A., S.K. Khalil, Z. Rahman, Misbahullah, M. Alamzeb, S. Khan and M. Ilyas. 2018. Effect of sorghum extract concentration in combination with herbicide application times on weed density and yield of wheat. Pak. J. Weed Sci. Res. 24(2): 13-145.